These peacock feather earrings are truly beautiful and will definitely turn some heads. I receive many compliments when I wear these. 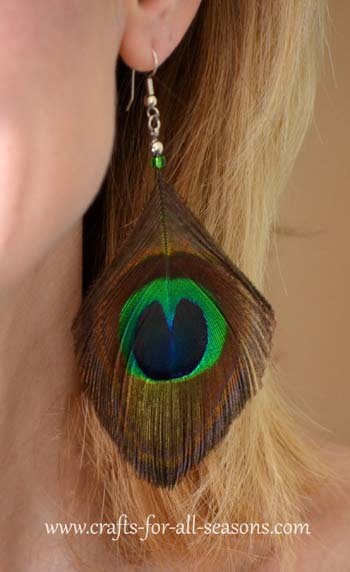 I have found that these peacock feather earrings go well with many different outfits and colors you are wearing, especially green, blue, and purple. They also look stunning when worn with a simple black top. Feathers are all the rage now, and it is unbelievably simple to put these together. Yes, you will need to buy the peacock feathers. I had a bunch left over from my daugther's peacock costume I made her last Halloween (that costume tutorial will be coming this Fall). 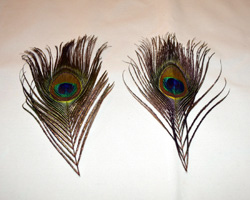 I had bought a few packs of the feathers from Joann.com for the costume and they were very economical. 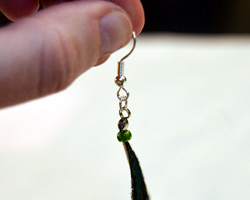 You will be able to make many sets of earrings with one pack of feathers. 1. 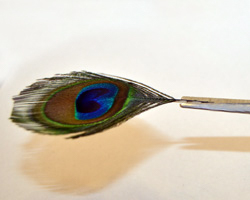 Begin by clipping off the tops of two peacock feathers. 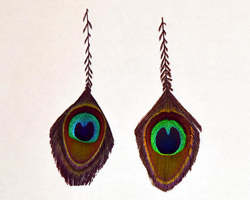 Try to pick two feathers that have centers which are relatively the same size and shape. Don't clip the feather too close to that center circle... not at first. 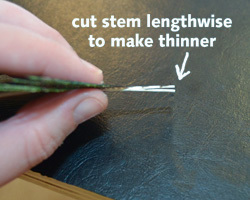 Leave at least an inch of the feather stem before clipping. 2. 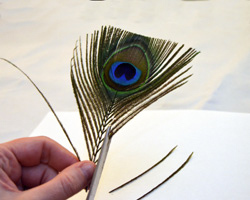 Next, using your scissors, clip away the individual feather fronds from the stem, leaving only the area that you want to have be your earrings. Also, cut off the ends of feather below the center circle, just straight across, as shown in the first photo on the left. You can leave them just like this (I've seen them like this at the store), or you can trim them up a little more and round them out a bit (like I chose to do, see right photo). Your stems should now have the fronds all clipped off. 3. The stem will be thick; too thick to string on beads. To correct for this, I made the stem thinner by using some scissors and cutting some of the stem thickness off, as shown in the photos below. I'm simply cutting the stem in half lengthwise, to make it a bit thinner. Remove the excess stem you cut off. 4. 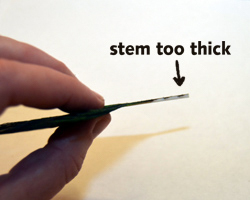 Now your stem should be thin enough to thread on any decorative beads you may like. I kept mine simple and threaded on one green glass seed bead. 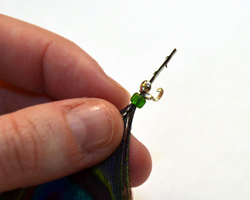 After any decorative beads you may want to add, thread on a double cup connector, as shown below. 5. 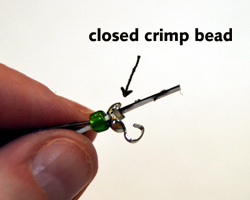 Next thread on a crimp bead. Pinch the crimp bead closed with some jewelry pliers. Crimp it close to the cup of the double cup connector, so that the crimp bead will be hidden when you pinch the double cup connector closed. 6. At this point you can cut off the excess peacock stem right above the crimp bead. Now you can crimp the double cup connector closed, covering up the crimp bead. Add on a jump ring to the loop of the double cup connector and close it with the jewelry pliers. Next, you can add the french hook earrings to the jump ring by gently opening it with the jewelry pliers, then squeezing them back closed. 7. One thing I love about these peacock feather earrings is that they are dramatic, being large, but they are so light! They are incredibly comfortable to wear and you will forget you have them on. Enjoy the compliments you will receive!